Medical writers aim to communicate complex clinical and scientific information clearly to a variety of target audiences. One important application of medical writing is the field of clinical trials and drug development. The BioM workshop focused on the main task of medical writers in this area: regulatory writing. Examples were given, how to write effective clinical study protocols (CSP) and clinical study reports (CSR) and how transparency and disclosure impact clinical trial documents. According to the speakers, good project management and teamwork are crucial for producing high quality documents, since CSP and CSR writing is a complex process. Moreover, excellent writing is essential so that health authorities can judge the risks and benefits of a drug, a clinical program or a healthcare product. The hands-on exercises “Protocol writing management” and “Anonymisation techniques” enabled attendees to experience the “bread and butter” activities of a medical writer. After the exercises, results were discussed and useful tools and practical approaches were given. 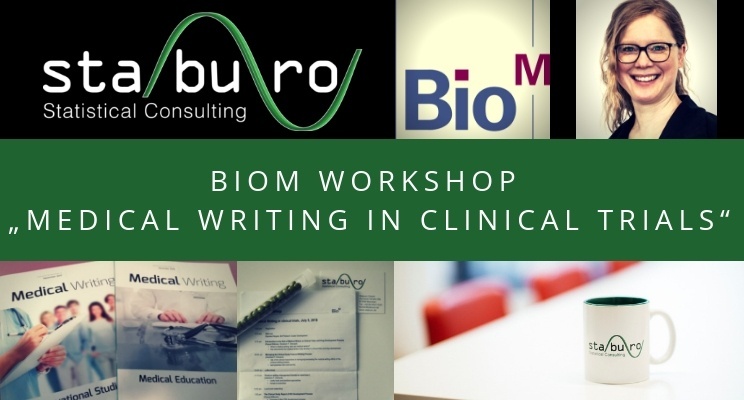 The “Medical Writing in Clinical Trials” workshop provided Staburo with a vivid insight into the daily life of a medical writer and also offered a chance to interact with other BioM event participants. Since Staburo also offers to deliver statistical reports (standalone or as part of the CSR), this workshop will probably increase speed and quality of our services.